Dr. Matt Blaze’s House testimony on the security of voting machines. #VotingMachines #eVoting It worries me that some form of e-voting was used in last Calgary municipal elections and more are being studied to be potentially used in the future. (Case of I don’t know enough.) As someone who has been following e-voting and development of secure voting machines for decades (a company I used to work for had a team that develop e-voting system), I have my serious reservations with e-voting and voting machines and want all levels of Canadian governments (city, provincial, federal) to study slow and proceed very very very carefully! To learn more, I’m watching UPenn’s Dr. Matt Blaze‘s House testimony on the security of voting machines. 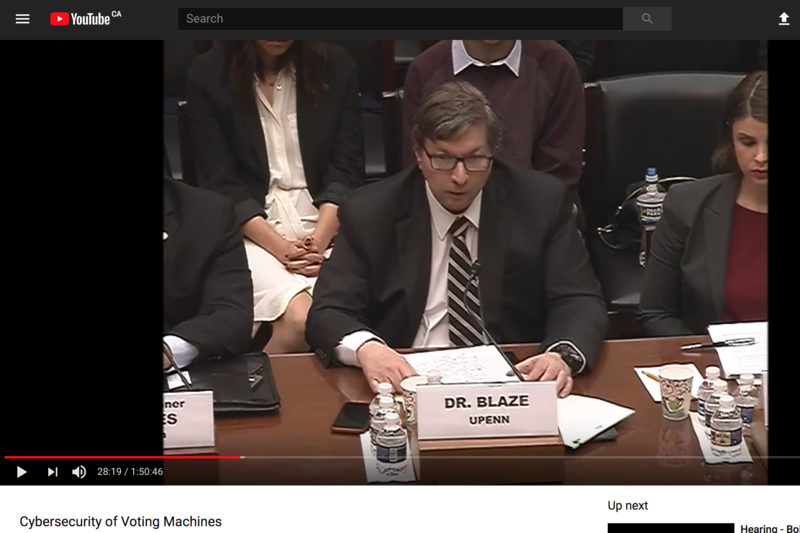 More of Dr. Blaze‘s testimonies here at these timecodes: 35m30s ; 54m19s ; 1h5m56s ; 1h30m30s ; 1h44m02s ; 1h48m25s and following individually video links to specific timecode segments. Ref: Bruce’s “Matt Blaze on Securing Voting Machines” entry started this for me today so many thanks to Bruce. This entry was posted on Tuesday, December 5th, 2017 at 12:15 PM and is filed under Computer Science, Internet, politics, Science & Technology, united states, YouTube. You can follow any responses to this entry through the RSS 2.0 feed. Both comments and pings are currently closed.